We are Pace Automotive - your full service NAPA AutoCare Center - with Service You Can Trust! Get your car as ready for the weekend as you are. Before you head out there, head in here! 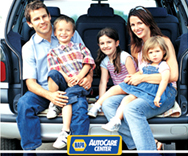 Get the NAPA AutoCare Peace of Mind Warranty from PACE AUTOMOTIVE. Qualifying repairs are guaranteed for 12 months or 12,000 miles, whichever comes first. to you, as a new full service Napa AutoCare Center! Our Master Technician and JTR Racing Crew Chief Jeremy Damewood has successfully maintained a fleet of over 40 vehicles for John Maine's Pace Heating and Air. The Pace Team, now with the launch of Pace Automotive, provides you with the same honest, affordable, and complete friendly service you have come to recognize in the Willamette Valley of Oregon and throughout the region. * Perform high-quality diagnostic and repair services at a fair price, using quality NAPA parts. * Employ ASE-Certified Master Technicians in all areas of work performed. * Be dedicated to customer satisfaction. * Exercise reasonable care for the customer's property while it is in the shop's possession. * Maintain the highest standards of the automotive service profession.